What I am curious about is how the TN section of I-69 will tie into the Purchase Pkwy with the complication of having the existing interchange with US 45E. KYTC Second District Engineer Kevin McClearn of the Department of Highways District One and Two offices in Paducah ... said the highway [I-69] will improve transportation, promote economic development and reduce congestion of highways ... Some difficulty is expected at the Tennessee line where officials hope to connect with a major interchange near Fulton. McClearn said both KTC and Tennessee Department of Transportation officials will likely meet soon to discuss details of how the roadway will connect with ongoing projects in the Volunteer State. During the meeting, Tennessee Transportation Commissioner John Schroer and TDOT project engineers Erwin White and Steve Chipman, said three segments of the highway are “moving forward.” .... Construction in the Union City area is nearing completion, according to White. It sounds like they need to preserve the corridor sooner rather than later. .... There are actually five new sections of I-69 in Obion County, as work on the interstate through Obion County is being done in phases. The interstate will enter Obion County off the Purchase Parkway and will extend along the existing Highway 51 for part of its route through the county. The interstate will split off from Highway 51 north of Union City and will extend around the west side of the city, across West Main Street, and then will cross West Reelfoot Avenue south of Union City and will parallel Highway 51 on the east until it reconnects with the highway south of Troy. A majority of the work on the local leg of the interstate has been done on Section 4, which extends from just north of the Titan Tire plant southerly to south of West Main Street. “Section 4 on the west and north of Union City is under phase 1 construction and is approximately 90 percent complete,” TDOT project manager Erwin White told The Messenger Tuesday. So far, more than $30 million has been spent on construction of the interstate project in Obion County. It is estimated the cost to complete the interstate leg through Obion County will take at least another $230 to $300 million, according to White. He estimated it could take up to 10 years and possibly as long as 20 years to complete I-69 through Obion County. “There is no new (federal) construction funding available right now,” Erwin told The Messenger Tuesday. I wonder if TDOT will actively explore alternative financing options for the Obion County work? The 2011-2014 TIP includes $883 million in total funding, with Tennessee and Mississippi state-sponsored projects reaching $329 million each. Tennessee locally sponsored projects are $204 million, while Mississippi locally sponsored projects are $21 million. Major projects of the 2011-2014 TIP are completion of Interstate 269 through Tennessee and Mississippi, which Srivastava said “will be completed pretty soon,” as well as interstate widening projects, highway interchange improvements, and the preliminary phases of Interstate 69 – which is anticipated to be completed by 2020. I recently noticed this compact map of SIU 8, which shows the connection to the northern terminus of I-269, as well as projected interchanges along the SIU 8 route. I recently received an email update from Steve Chipman, Project Manager responsible for SIU 8, regarding progress on the SIU 8 FEIS .... Third quarter of 2012, the record of decision signed. FHWA is requiring that both SIU 14 and 15 are programmed with funding for the Engineer/Design Phase (phase that typically proceeds the completion of the Environmental Study/Assessment). As it stands now, LADOTD will modify the State TIP (i.e. STIP) in accordance with our requested TIP amendments for both SIU 14 and 15. Once that housekeeping issue is completed, we anticipate a ROD being signed for SIU-14 in late April. We are anticipating having a FEIS by the end of the year and the ROD by year end or first quarter of 2013. The answer to your second question is that we already have funding for Engineer/Design phase on SIU 7, 8, and 9. We need money for acquisition and construction. Progress on the local section of Interstate 69 continues to be stalled by a lack of federal funding. Work on one local section of the interstate is continuing, and is actually ahead of schedule, according to Michael Harrison of Ford Construction. Ford Construction has the contract for Section 4 of I-69, which extends from just north of the Titan Tire plant around to just south of West Main Street .... Phase 1 construction of Section 4 is “nearing completion,” according to Erwin White with the state Department of Transportation. “Phase 1 construction refers to grading, structures, roadway tie-ins that are necessary to maintain traffic around and across the project, erosion control, etc.,” he stated. Phase 2 construction for that section has not been budgeted. That phase involves the completion of the interstate base, asphalt paving, installing guardrails, installing signs and striping the interstate. The entire local leg of I-69 will enter Obion County from South Fulton (Highway 51 South) and will continue along Highway 51 South until it veers southwesterly at Mayberry Road. The I-69 route winds north and west of Union City until it crosses over West Reelfoot Avenue and then continues south around Troy before reconnecting with Highway 51 South and continuing on to Dyersburg. “It’s still ahead of schedule and it’ll be finished on time,” Harrison told The Messenger earlier this week about Phase 1 work on Section 4 of the interstate. In all, there are five I-69 sections in Obion County, according to Erwin White, project manager for the state Department of Transportation. From his office in Jackson, White continues to monitor the progress of I-69 through West Tennessee. The right of way acquisitions for Sections 1, 2 and 5 are complete, but no construction funding is budgeted for those sections, according to White. The anticipated cost to complete I-69 through Obion County is estimated at $230 million to $300 million, according to White. He said right of way acquisition is about 85 percent complete for Section 3, but no construction funding has been budgeted. That new section of interstate begins where the current work ends just south of West Main Street, and the section continues across East Old Troy Road (east of Bel Air Circle) until it intersects at Walker-Tanner Road. Ford Construction crews have been working on the overpass at West Main Street and the extension of Section 4 where it connects to Section 3, which is in a field south of West Main Street. “It won’t be much longer,” Harrison said. However, until federal funding is allocated for the project, the interstate will remain covered with what Harrison called “incidental asphalt.” The final layer of gravel and asphalt paving will have to wait until funding is approved and contracts are signed for the work. “If they don’t let any more sections ... it’ll stay closed,” Harrison said. Looks like the money fairy is MIA in NW Tennessee, too. However, until federal funding is allocated..."
Because they, like just about everyone else, would prefer to feed off the Federal teet until it's completely dried up instead of making their own milk. Not 100% of the time. TN 840 has been funded 100% by the state so as to avoid stricter Federal environment regulations. That's part of why it's TN 840 instead on I-840 like my avatar. But, since TN is still paying for 840, they probably don't have much left to fund anything else without Federal aid. I-69 won't be done in Tennessee until about 2025. The amount of money it will take to complete I-69 from Michigan to Mexico is staggering — $25 billion. It is estimated $1.5 billion will be needed to complete the interstate route through West Tennessee. For Obion County, $230 million to $300 million is needed to complete the route from Fulton to the southern border of the county (loosely following Highway 51 South around Union City, Troy and Obion). The federal government has taken a conflicting position on I-69, on one hand designating the interstate as a “high priority corridor” and a “corridor of national significance” and, then on the other hand, withholding federal funding for the interstate. That’s a problem for Bill Revell, the former mayor of Dyersburg and the longtime I-69 Coalition vice president. 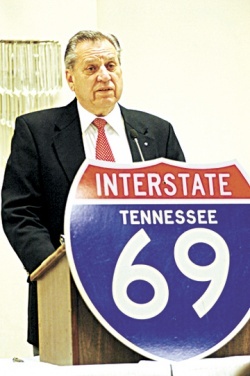 He was the main speaker at the annual meeting of the I-69 West Tennessee Coalition, held in Union City Wednesday .... Revell said the coalition needs to develop a “new strategy” to fund and complete I-69 and get the project back on track. • The use of SAFETEA-LU (Safe Accountable Flexible Efficient Transportation Equity Act — A Legacy for Users) funding for I-69. The route of the country’s only unfinished interstate extends from Michigan through Indiana, Kentucky, Tennessee, Mississippi, Arkansas, Louisiana and to the southern tip of Texas at the Mexico border. Tennessee did pass the Tennessee Tollway Act in 2007. However, nothing has come out of it other than feasibility studies. Indiana Bat to Alter Route of Tennessee's I-69? the area was used for a landfill and the soil is not suitable for the construction of a highway ... it was determined that a shift in the alignment approximately 500 ft. east would avoid the landfill. We are anticipating having a FEIS by the end of the year and the ROD by year end or first quarter of 2013. More articles from the Evansville Courier Press. I ... am not grasping the bat issue. Will I-69 be built or could it become like US 31 near Benton Harbor, Michigan where there will be a permanent gap? I'm under the impression that the bat issue isn't going to harm the overall timeline and that Section 4 will still be done in 2014. Parts of that section can still be worked upon this summer, just not the parts with those trees for the bats. TDOT crews are already hard at work looking for this endangered mammal that could have a big impact on that interstate. It's called the Indiana Bat. It's gray, black, or brown in color and weighs as much as three pennies. This miniature mammal could determine where Interstate 69 travels from Millington to Dyersburg. "We're searching for bats," said TDOT Community Relations Officer Nichole Lawrence. TDOT officials say the endangered bat has already been spotted in East and Middle Tennessee. Even though the route has been decided, the Indiana Bat could shift the interstate a few feet if a habitat is located. TDOT's August 3 letting includes the 2.667 mile section of I-269 from the Mississippi state line to TN 385. ^ I am looking at the plans now, and it appears that this segment will be signed as I-269 when finished. Since MAP-21 apparently contemplates allowing "TO" and "TEMPORARY" signage for I-69 ... I would like to see ... all I-69 overlaps in Memphis immediately add I-69 signage; and ... Have the section of US 51 parallel to the new terrain SIU 9 I-69 corridor immediately be signed as TEMPORARY I-69. Even if TDOT does not immediately install I-69 signage in metro Memphis, I wonder if I-69 signs will be installed in some form or fashion when the above I-269 segment is opened for travel in 2015? The bigger question is will I-155 retain its number when its eastern terminus will be at I-69? It could no longer use the first digit odd principle if it terminates at two interstates. Why would they renumber it just to conform to a numbering convention that nobody uses anyways? Roads that connect at both ends to an interstate but aren't a bypass are kinda in a gray area anyways. They could always decommission it and just call it US 412, since that number is as out-of-compliance as an I-155 that had interstates at both termini would be. US 412 is less compliant than I-155 meeting another interstate at it's far end, surely? There's bag loads of precedent for 3dis that are odd as they don't join back to their parent route or any siblings (plus other ones that do 'keep it in the family'). I-135 (KS), I-155 (IL), I-170 (MO) - another that the route at the far end became interstate later, I-195 (RI-MA) - meets a sibling at far end, I-196 (MI), I-335 (KS), I-355 (IL), I-376 (PA), I-380 (PA), I-390 (NY) - far end became interstate later, I-395 (CT-MA), I-505 (CA), I-520 (GA-SC) - meets parent at both ends, I-580 (CA), I-590 (NY) - meets siblings at both ends, I-780(CA) and I-980 (CA) - meets two siblings. The rule really only is that it doesn't terminate at its parent (the Illinois usage of odd 3dis and California's I-505 come to mind), with the extended I-520 and I-376 being the two recent exceptions to this. Well stranger things have happened before. Anyway the real thing I was getting at I was totally unsure of how exactly the numbering scheme really worked for 3 digits. I was told why I-684 in NYS was allowed to be first digit even though it is a spur of its parent and not a loop. It is because both terminuses interchange with other interstates. Then someone wrote into Wikipedia about I-495 being a violation because its 1980's extension past I-295 to Eastern Long Island near Riverhead requires it to be a first digit odd cause it ends at a non interstate facility as before it connected to two interstates at each end. Remember, originally I-495 was to cross Manhattan and be NJ 495 is now. So it would have connected its parent in Secuacus, NJ and I-78 then I-295 in Queens under its original scheme. I am well aware of I-376 breaking the rules and I have seen some suggestions on here or other roadgeek sites that this should be changed or in a perfect world swap places with I-476 would be best is my suggestion. I could really care less what they call it as I do not loose any sleep like many do on this forumover roads not conforming to FHWA standards. Heck call it plain ol US 412 that is not in the grid or even call it I-238 eastern extension. Major projects of the 2011-2014 TIP are ... the preliminary phases of Interstate 69 – which is anticipated to be completed by 2020. I-69 is a highway of national significance, reaching far beyond the borders of Tennessee. So far our investments in I-69 total more than $200 million, most of which was comprised of federal earmarks with some state matching funds. At this time there is no further federal funding dedicated to the I-69 corridor. Without a commitment on the federal level, Tennessee and other I-69 corridor states, are faced with difficult choices on how to proceed with the development of I-69. It is difficult to continue our efforts to engage the public regarding I-69 projects when we are unable to define schedules and provide property owners with the information they desire. These are the reasons TDOT has made the decision to postpone any further public meetings and design work on the various segments of I-69 until there is a dedicated funding source. When and if the funding issue is resolved, TDOT will be ready to resume work on I-69. As I've mentioned on more than one occasion, Tennessee has a tollway authority, even though it's dormant. The hard part would be getting to feds to allow parts of I-69 to be a toll road. The hard part would be getting to feds to allow parts of I-69 to be a toll road. I believe that a bypass along US 77 that will be a portion of I-69 in south Texas is going to be built as a toll facility. Is there a real need for US 77 to be a freeway? Isn't it a 4 lane divided road from Victoria to Harlingen except for a few short stretches? From the looks on the map, there are long stretches of nothing. Isn't that good enough? What is the speed limit (I'm guessing 70.) If there are small towns it still goes through, then by all means bypass them but building a new interstate next to a perfectly good 4 lane highway seems wasteful to me. And why is US 281 being upgraded when it runs 20-25 miles west and parallel to US 77? The whole I-69 deal stinks of pork.